When I first saw Cuphead however many years ago, I was immediately reminded of an early episode where Jake talked about how great it would be to make a game with animation from this era (might have been the JP episode?). You aren't going to barf forever, it's not that bad. 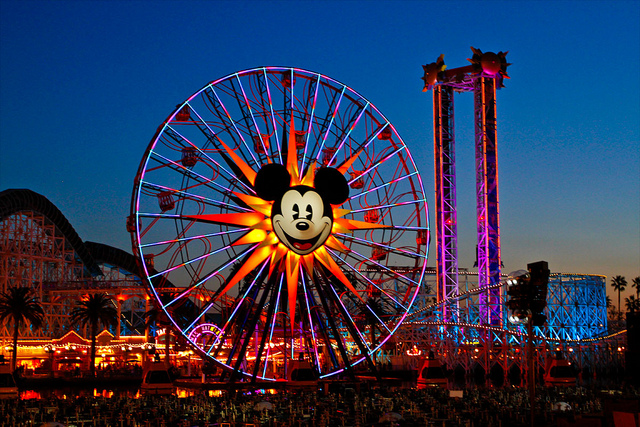 It's actually kind of boring, because of how ferris wheels operate. On a ferris wheel, you have to wait for an eternity as they load everyone, which is fine, since you're really on a ferris wheel for the view, right? But on the swinging gondolas, you kind of rock back and forth a little bit (in a manner similar, but perhaps more exaggerated from the stationary gondola experience) while the thing starts and stops as each set of passengers load. But at two points, on either side of the ride, you roll across, down the little arc, and then wobble back and forth for a while. You can see exactly when it's going to happen, since you can watch and hear the other passengers. But, because of how long it takes to load, you settle into an equilibrium, and then it's just like taking the stationary gondola. After everyone is loaded, they may send the whole wheel around a few times, and at this point, it's slightly more exciting, since you don't have the pauses, but never barf inducing. 1) The line is often much longer since people wanna get on those swinging gondolas, and there's only one line, while there are two stationary gondola lines. 2) You don't even end up getting as good of a view, as you can see in the image, since you never get as high above the ground as the stationary gondolas. e: And this is off-topic, but I just looked at their blog and it turns out they took a picture of me playing with my phone while I was waiting in line for their game. That was a weird thing to stumble across! Congrats Danielle on a full year as an official Thumb! You've even accomplished the crowning achievement of a true Thumb: leaving for another city, breaking everyone's hearts! All those stats and rankings in the New York Times app make me apprehensive! I use an alternate crossword puzzle app (I think it's just called "Crosswords") and there are some statistics, but even more ways to get hints and cheat which is good for me because I'm terrible. I purchased the app to use it for the American Values Crosswords (the old Onion AV Club crossword team), but also enjoy some of the hipster puzzlers Brendan Emmett Quigley, Liz Gorski, and Chris...Words? One of the puzzles I subscribe to just sent out an e-mail about Lollapuzzoola, a crossword puzzle tournament in New York City this August. I'm curious, but I will fail brutally in public and I wonder how bad that will be. Am I the only one mostly disinterested in Cuphead? It accurately captures the uninspired character designs and stilted animation of animation in the late 1910s and 1920s while eschewing the progress made in the, but why? There's a reason everyone abandoned that ugly movement. I suppose they could have had nicer characters like the cuteness of Felix but they didn't. I guess Sonic the Hedgehog stole his design already. I don't know, never enjoyed a Fleischer cartoon I guess. Like even if they wanted to use the bland rounded 1920s aesthetic, they could have used the current principles developed in 1930s and 1940s and it would have looked so much better, since almost no one in the audience is going to tell the difference anyway. Just looking at that animation feels bad even though it's nearly 100% accurate, except it probably shouldn't be in color. I wish they had gone the Shovel Knight route while keeping the general aesthetic accurate, it's built upon to be more palatable past the inherent limitations. Oh well, I guess there's some pointless negativity to this thread. I know nothing about the history of cartoon and animation, but I would be interested to hear more about these differences. Hmm. I suppose it would maybe be easiest to illustrate between an older Fleischer cartoon and a 40s Merrie Melodies. Cuphead is very much imitating the movement of the Flesicher short, and quite well. But the problem with the movement there is there's no anticipation or follow through in anyone's movements and no acceleration or deceleration for the most part. Characters often just stop in the middle of movements for a few frames, probably because they were being drawn exclusively from pose to pose without much overlapping action, like the ears of the dog character in the short always stopping at the exact time he stops moving. I would guess it was just finicky to keep drawing and testing all of that stuff as equipment sounded like the biggest hassle in the 20s. This one lands right on 1930 which for the rest of the decade, the whole industry was transitioning to smoother more natural movement through lots of experimentation such as getting appropriate speeds right, like slow and flowing for more beautiful cartoons and quick and violent for gag cartoons. 1920s stuff just kind of floated around for the most part. The second I guess would be easiest to see the difference with the dog popping out of the bush at 2:48. He quickly jumps out and then when he hits the top of his movement he slowly deflates to a less extreme pose. In a cartoon produced a decade or more earlier, the dog would probably slowly move to the jumping out pose and just stop for a few frames until moving to whatever happens next. There's also a lot of paint smearing to nicely convey movement through motion blur without meticulously drawing every pose inbetween. A lot of these techniques would have meant less drawing for the Cuphead team. The Merrie Melodies short works well on conveying a bunch of action and I think it would fit much better to take that movement for a video game and then just use the general rounded character, rubber hose limbs, and big eyed Fleischer aesthetic. Also apologies if any of that came off condescending or overexplaining or something, I don't mean it to be. I also watched a lot of the assets in the newer Cuphead trailer and the characters move much more in line with modern animation principles than the complete throwback that was shown in the trailer from last year. I think there's a lot of room for 'bad' animation so long as it's done with care and intent. Like, even though they looked really funky in a ton of ways, I would love a game that aped the aesthetic of an old stop-motion animated short -- probably a lot more than I would one that hints at that style, but breaks from it freely. Though I probably agree with the decision pragmatically, I was disappointed at the use of CGI for stuff like smoke in Box Trolls for that reason. I think I would probably hate The Neverhood if it were animated like a Gumby cartoon. Well, The Neverhood wasn't really pursuing that aesthetic, so they would have undermined their own intent to do so. I kind of feel like the segments that were basically drawn animation run through a filter (the Willy Trombone monologue disks) kind of undermined the games aesthetic as it was.. I think, though, that an action game that looked like Ray Harryhausen stop motion animation could be kind of really awesome, even if the choppy motion and flickering light that was typical of those segments was accidental I think they added a unique character which is worth examining and trying to invoke towards a specific aesthetic intent. I feel kind of the same way about 20s-30s animation: I totally agree with you that it is, in general, less satisfying, but I also think that its unnaturally smoothed-over motion and bendy jointlessness could be harnessed towards some really interesting and cool aesthetic ends. Super Hypercube! I played that game once on a projector with red-blue 3D glasses, and it was a lot of fun. It's one of those few things where stereoscopy (and head tracking) actually helps because of the perspective it forces you into, kinda like those bonus levels in Super Mario 3D Land. I'm glad it's getting a new life with VR. Superhot in VR sounds rad as hell. Everything in this post is Super. And 3D. Not at all. Thanks for taking the time to pointing out the major differences to me! After this, I'd be interested in seeing the animation style of Cuphead subtly improve from level to level. Then again, that could get too gimmicky really fast. Aside from the animation style, I'm stoked for Cuphead because it looks a lot like Rockman: The Power Battle, which was an arcade game consisting of just the boss battles (ie the best parts) of the Mega Man games. So good. There's a reason the film industry moved beyond traditional black & white cameras and stopped having their actors smoke so much on screen, but the Coen Brothers' The Man Who Wasn't There is one of my favorite movies at least in part because of how its loving adoption of old style and technique suggested such a strong artistic vision. I think you'd have reason for dismay if it looked like a significant number of studios were going to be adopting the same style any time soon, but based on how much work the game has apparently taken, I don't think you have much to worry about there. Regarding your actual criticisms of anticipation/follow-through/acceleration, I have to say that to someone more or less completely ignorant of animation techniques (i.e. me, and I self-servingly assume many others), your objections seem almost entirely like inside baseball, especially in a game where cup people fire finger guns at sentient vegetables. And given how so many games seem to me to have virtually no artistic intent, and instead slot into a small number of familiar styles, this game comes as such an immense breath of fresh air that its uniqueness for me outweighs a hundred fold any technical criticisms of the animation. Pretty much the only thing that could get me down on the game at this point is if it ends up feeling really clunky or something. For me, the game just screams originality and style: the intertitles, the finger guns, the original jazz, the drone bees with ties and briefcases, its economy with exposition (as compared to something like the FF7 remake trailer, for example). I've watched the trailer easily 20 times and find more to like about it every time. In this case, I think utter ignorance (of the history of animation) truly is bliss. I went on the Wonder Wheel at Coney Island and I don't remember having to wait very long, and I thought the sliding around was a lot of fun. Maybe they run it longer between loading there? And definitely not more nauseating than any other amusement park rides I've been on. Well while I like that movie, I don't feel like it is aping any kind of early style of film, which is more analogous to what I'm saying. It is steeped within fitting an established noir style developed much more solidly after the 20s were through. The flying saucer in the movie is definitely a mid century callback in film instead of an early century one. Cuphead apes a more primitive era of animation. For The Man Who Wasn't There to equivacolly ape short film styles from the 1910s and 20s you'd have to have the camera continuously under or overcranked, bad edits, picture off track, and just general technical difficulties which I equate to the stilted animation of the 20s. While maybe that would make a neat short to mimic all of that stuff, if The Man Who Wasn't There were like that the whole time I'd hate it.The Man Who Wasn't There plays like a smooth moody 1940s film as that era, the technical aspect and cinematography was already well established. You could also juxtapose any Chaplin short from around 1918 to his later 1936 film Modern Times and see what progress from continuous attention to timing and speed can do. Almost everything Chaplin pre Mutual is hard to watch nowadays, especially if you caught one of his later works first. And given how so many games seem to me to have virtually no artistic intent, and instead slot into a small number of familiar styles, this game comes as such an immense breath of fresh air that its uniqueness for me outweighs a hundred fold any technical criticisms of the animation. I guess that's where you and I differ. I feel like these days tons of games come out with unique styles and new aesthetics, it's sort of a gold mine, and instead Cuphead feels very basic to me. The thing I'm impressed with is how 1:1 they got the look of a Fleischer style short but I suppose that's about it. Kind of wish if game studios are to attempt the rigorous deman of traditional animation that they might try instead try something a little bit more fresh.